Members of Congress are calling for answers after a former Planned Parenthood employee alleged the organization has quotas for the number of abortions it needs to perform to meet its budget. "With the vast amount of money Planned Parenthood receives from U.S. taxpayers, it is critical that we determine whether or not any staff members were told that their salaries were contingent on their pushing a certain number of young women to abort their babies. The idea of salaries being contingent on the number of babies destroyed is unmitigatingly evil," Texas Rep. Louie Gohmert told The Daily Caller. Fellow Republican Texas Rep. Steve Stockman also called for accountability and criticized Congress' failure to defund Planned Parenthood. "There's one thing more repugnant than the latest revelations about Planned Parenthood's insatiable appetite for killing as many babies as possible to maximize profits. And that's the refusal of too many to exercise Congress' purse power to defund Planned Parenthood. The Republican Party has maintained majority control of the House of Representatives for 16 of the last 20 years and has failed to do so," Stockman told The Daily Caller. The congressmen's anger stems from allegations made by Abby Johnson, a former Planned Parenthood director at a Bryan, Texas, clinic. In interviews and on her blog, she has said budget documents in her possession from the Bryan clinic for the fiscal year 2010 show that the organization had established quotas for abortions. According to Johnson, the "unit total" listed next to a line item that reads "Income, self-pay (surgical)" in the budget represented the number of abortions that needed to be performed for the fiscal year. "I didn't think I had any proof. I talked about it all the time, I talked about it when I gave speeches, I talked about it to the media, but I had nothing to actually back up what I was saying," Johnson told KBTX-TV. Johnson left the clinic in 2009 to become an anti-abortion advocate, and the clinic closed in 2013, according to KBTX-TV. Planned Parenthood's political affiliates will spend more than $15 million on congressional and state races in 2014, Politico reported in February. In June, Johnson posted on her website a photo of an award given by Planned Parenthood of the Rocky Mountains, the second-largest affiliate in the nation. 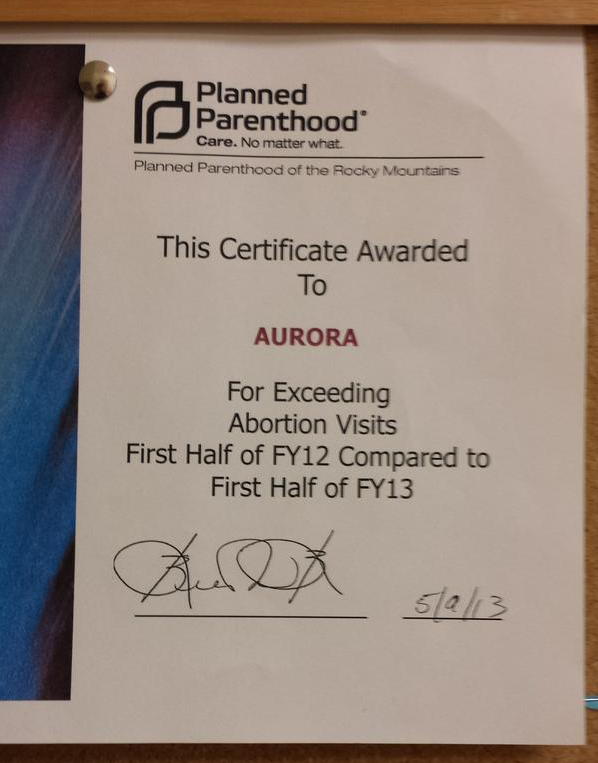 Posted on a bulletin board, the award was given to an Aurora, Colorado, clinic for "exceeding abortion visits first half of fiscal year 2012 compared to first half of fiscal year 2013." LifeNews.com posted a photo of the award as well. In a post on the Planned Parenthood Action website, Planned Parenthood of the Rocky Mountains President and CEO Vicki Cowart responded to the controversy surrounding the award, declaring, "[f]irst, and plainly, Planned Parenthood does not have 'quotas' for any of our services." She then proudly admitted that the award was issued, writing, "yes, we absolutely do celebrate our progress in ensuring that more people have access to the full range of reproductive healthcare, including abortion. And we always will." In 2011, Johnson wrote a guest column in The Hill titled "Exposing the Planned Parenthood Business Model," in which she argued for Congress to act to end federal funding for the organization. Planned Parenthood "also claims to help reduce the number of abortions. Not only is this not what Planned Parenthood actually accomplishes, but its goal couldn't be more opposite," Johnson wrote. "As a Planned Parenthood clinic manager, I was directed to double the number of abortions our clinic performed in order to drive up revenue. In keeping, Planned Parenthood headquarters recently issued a directive mandating that all of its affiliates provide abortions by 2013."